When light strikes a discontinuity in the medium through which it is propagating, the wavelengths that pass through are said to be transmitted and wavelengths that do not pass through are said to be blocked or attenuated. When working with fluorescence, optical filters serve as the discontinuity and can be made to selectively transmit or block certain wavelengths. Blocking (attenuation) can be accomplished by reflecting or absorbing light by the filter and the degree to which a filter transmits or attenuates light is completely dependent on its constituent materials and the way they are used in its construction. A rainbow seen after shining light through a prism, for example, is a transmitted light spectrum. It is a visualization of the wavelengths of light that the material failed to attenuate (reflect or absorb). Transmission, reflection and absorption are all measurable properties and are used to quantify the ways materials interact with light. 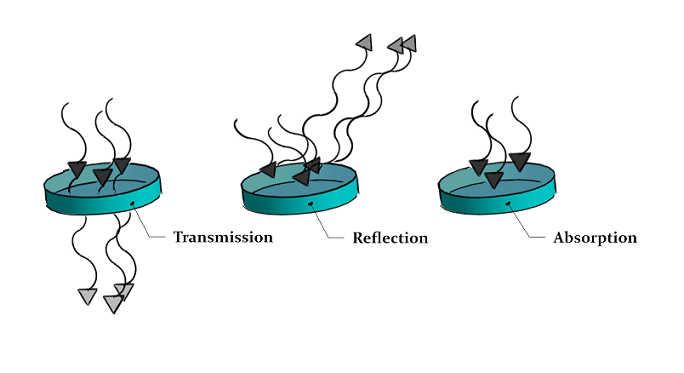 The illustration above visually highlights the basic principles of transmission, reflection and absorption.